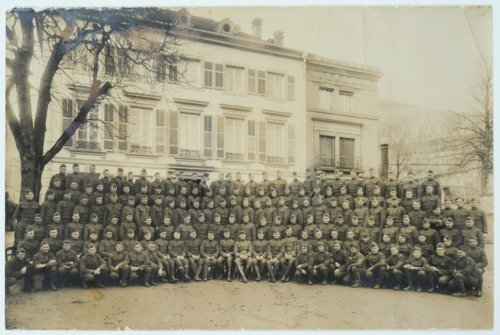 This is a panoramic photograph showing the first platoon of Company M, 355 Infantry, 89th Division in Saarburg, Germany. The 355th Infantry was organized on August 5, 1917 and assigned to the 89th Division at Camp Funston, Kansas. Soldiers in this unit came from Nebraska, Kansas, Missouri, and Colorado. On May 21, 1918, the regiment left Camp Funston for New York and was encamped at Camp Mills, Long Island. On June 3, the regiment traveled from Camp Mills and boarded the transport RMS Adriatic in Hoboken, New Jersey for England. After the war ended, the 355th Infantry left Europe and traveled to Camp Funston where the regiment was demobilized.